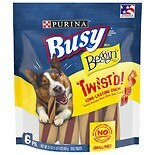 Shop Purina Beggin' Twisted Dog Treats Small/ Medium (21 oz. )21 oz. 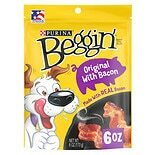 Shop Purina Beggin' Strips Dog Snacks Bacon (6 oz. )6 oz. $399$3 and 99 cents$0.67 / oz. 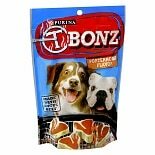 Shop Purina T Bonz Dog Snack Porterhouse (10 oz. )10 oz. Generations of dog owners rely on Purina when it comes to feeding their four-legged friends, and Purina dog treats are a great way to show your canine companions how much you care about them. Choose from a wide selection of Purina dog treats and order them for shipment directly to you. When you want to reward your dog during training, or just show your four-legged buddy that you appreciate canine friendship, Purina dog treats are a convenient addition to your dog's regular diet. You can give your dog one of the many healthy varieties of Purina dog treats in addition to regular dog food and in place of other treats such as bones or regular meat. Purina dog treats include traditional crunchy dog biscuits as well as soft and chewy treats that dogs just love. The various varieties of Purina dog treats include nutrients that help keep your pet as healthy as their delicious flavors keep it happy. You can order a wide variety of Purina dog treats to keep around the house whenever you want to give your dog something special. Chewy dog treats from Purina include miniature chew-bone treats that let dogs exercise their instinct for chewing while enjoying tasty meat and healthy rice, as well as full-sized edible chew-bones that your dog can enjoy licking as well as chewing for extra great taste. Dog biscuits and tasty meat, bacon and bacon-and-cheese flavored strips are also found among the wide assortment of Purina dog treats.